There are countless coffee shops across America where Sunset Hill Stoneware's unique mugs can be found. However, not all of these coffee companies use their mugs for the same reasons. Although there are far more ways to use our stoneware products than we can list, here are just a few ways some of our customers use theirs. It almost goes without saying, but Sunset Hill Stoneware mugs are perfect for serving your blond roast, Vienna roast and everything in between. In addition to our famous ceramic coffee mugs, our shot glasses are a popular choice at coffee shops. These tiny ceramic cups have plenty of practical uses inside a coffee shop, including for serving samples and shots. For example, Caffe Ibis has used our Cheers shot glass to prepare and serve espresso drinks at their Salt Lake City and Logan, Utah locations for years. Thanks to their handcrafted quality, these shot glasses keep the espresso piping hot longer after it's served than traditional glasses. Regulars at Caffe Ibis might also notice that the stoneware mugs have the same effects. This is because the solid clay bodies of our stoneware retain heat better than traditional mugs that are made using molds or slipcasting. They also make for a better drinking experience with every sip of espresso. 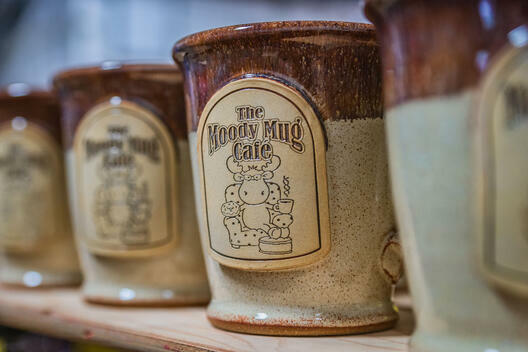 Along with Caffe Ibis, other coffee shops where you might be served out of our mugs include the Moody Mug Café in Groveton, N.H. and Blue Door Coffee in Campbellsport, Wis., among many others. Even without serving coffee in their unique mugs, some coffee companies offer them as souvenirs alongside other promotional swag. Aside from having some of the best Kona coffee on the island, Maui Coffee Roasters offers their unique coffee mugs to guests as souvenirs after they go home, whether it's just a few blocks away from the shop in downtown Kahului, Hi. or thousands of miles away on the mainland. Not only does it allow local fans and tourists alike to show their love for the coffee company, but it also allows them to further support their profits while they focus on what they like making the most. These mugs come in nearly every glaze we offer, for an extra dose of that colorful island vibe. Each mug features either of two designs: one featuring a classic station wagon loaded up for a day of surfing, and another showing the roaster's classic logo with a hula dancer. 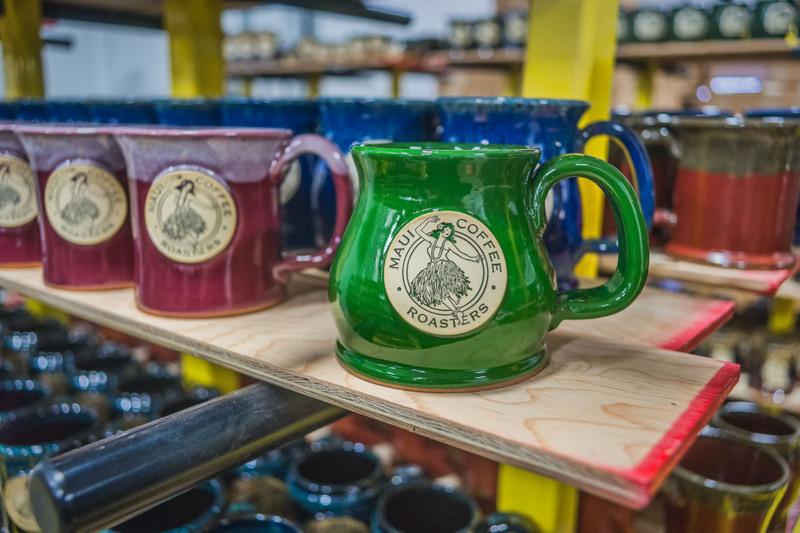 Whether you want to collect each color or are only looking for your favorite shade, the mugs that Maui Coffee Roasters offers make for an unforgettable souvenir or gift that will last for years to come. Other coffee companies with souvenir stoneware include Door County Coffee & Tea in Sturgeon Bay, Wis. and The Blue Banana Espresso in Lostine, Ore. Both coffee shops make great caffeine stops during your next road trip through the Cascades or on a weekend drive through Door County, along with offering unforgettable gifts. It's no secret: Sunset Hill Stoneware mugs are made to last. Long after the logos on printed mugs and T-shirts have faded, these ceramic logo mugs still show any brand with vivid detail. Barring gravity, they're also practically indestructible—legend at Sunset Hill Stoneware has it that our mugs have even survived a fire unscathed after a customer's business burned down several years ago. Plenty of coffee shops use our mugs to promote their brand on social media, in photos and through displays. Some have been doing it for years. 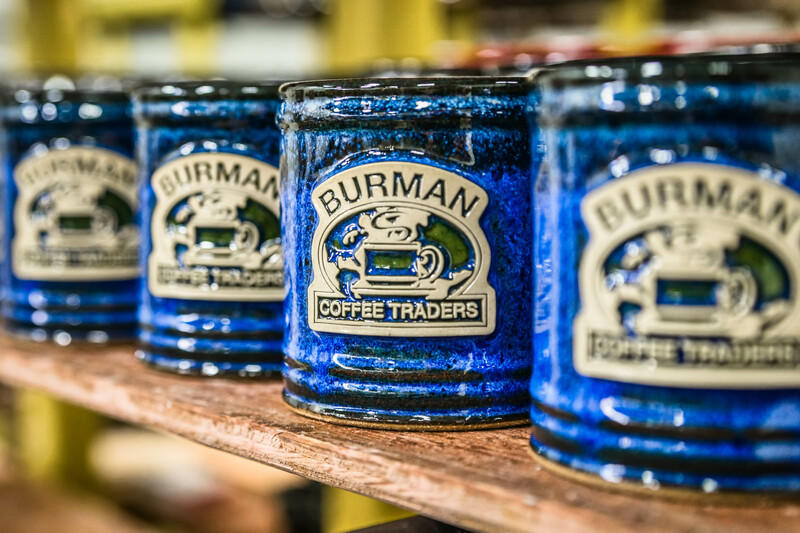 For example, Madison-based Burman Coffee Traders uses our mugs on their Facebook page to demonstrate recipes using their coffee and tea. They've even posted these recipes using now-retired glazes and styles like the Traveler in Seaspray, which was based in Seafoam. There are other coffee shops that continue to use our stoneware for added branding years after ordering their pieces. For example, Luna Cafe in De Pere, Wis. and Eagle River Roasters in Eagle River, Wis. use pieces left from when we used to make stoneware vases in years past. The vases make beautiful display pieces in their shops and still proudly flaunt their company logos. These mugs are capable of lasting for years to come and can bring branding opportunities with them wherever you go. 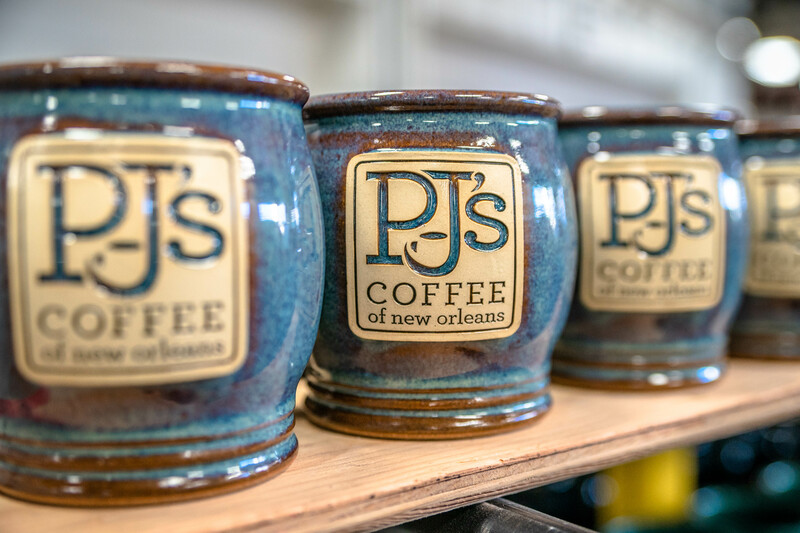 Whether it's as serving pieces in a coffee shop or souvenirs for guests, Sunset Hill Stoneware's mugs show that a business cares about quality. With the mug as a first impression, customers know that they're about to be treated to an high-quality experience from start to finish.